Flexible OLEDs: are they the future? 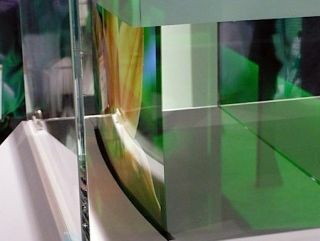 Sony has shown off another OLED prototype at this year's Ceatec, with a razor-thin flexible screen on display. Coming in at 0.3mm thick, the prototype highlighted yet another reason why OLEDs can be considered the display technology of the future, with the ability to make flexible displays or lighting. The model Sony showed, via Engadget, appears to be on a metal substrate, which explains the slight curvature. Metal is often used as a way of protecting the OLED materials inside, although fully rollable OLEDs on plastic will be possible in the future. Still costing far too much to manufacture and produce, OLEDs still have that 'wow' factor of futuristic technology, and Sony's curved display is another example of what might be expected in years to come. No word on when this type of technology is going to be available in the shops, but it will be at least a decade before you can start bending your 50in OLED TV.